International Review of Social Research, a scholarly peer-reviewed journal, welcomes articles of all areas of sociology and social anthropology. All topics, methodological strategies and geographical locations are considered valuable, as long as articles are both theoretically and empirically grounded. Comparative, ethnographic, critical and space-sensitive approaches are welcomed. Guest editors: Duncan Light (University of Bournemouth), Craig Young (University of Manchester Metropolitan), Laura Grűnberg (University of Bucharest). The International Review of Social Research (www.irsr.eu) seeks for articles for a special issue on food and culture to be published in May 2016. The alternative space is not a location, a passive space in which we live but it is lived and embodied, constructed and deconstructed through various social interactions and significations attributed by different social actors in different historical, geographical, political, economic, cultural contexts. Lefebvre (1991) defines the space as a social product shaped by our interactions and the social environments. It becomes a space of social practices that involves the cognitive, sensorial and emotional involvement of the social actors. The third space, mental space, perceived space interacts continuous with each and every one of us, mediating the processes of movement in time and space and the relationships with the environment. The aim of this special issues is to bring and focus the discussion on the concept of alternative space: (i)	at the crossroads of various disciplines (e.g. sociology, mental geography, geocriticism, environment psychology, imaginative geography, art, anthropology, urbanism, literature, etc. ); (ii) within the context of a full range of methodological perspectives (quantitative and qualitative) and levels of analysis (micro- messo and macro). Some possible topics of the papers may be related to (but are not restricted at): •	The alternative space as an area of the interdisciplinary field of study; •	Methodological innovation in the study of the alternative space; •	Art and space; •	Space and every day life; •	Urban regeneration; •	The gendered space; •	Space and intersectionality; •	Non spaces/Meta-spaces; •	Smart Spaces. The authors are invited to send papers in English (4,000 – 8,000 words including references) together with an abstract of no more than 150 words to the following address: to Adina Manta (adina.manta@ymail.com) with copy to irsr@sas.unibuc.ro until March 1th, 2016. Prior to submission, please check author guidelines at http://irsr.eu/instructions.html. Call for papers: ‘Food and culture. Cultural patterns and practices related to food in everyday life’, special issue of International Review of Social Research, Volume 5, Issue 1, May 2016. Guest editors: Jean-Jacques Boutaud (Université de Bourgogne), Anda Becuţ (National Institute for Research and Cultural Training), Angelica Marinescu (University of Bucharest). As an everyday activity, sustaining our life, eating experiences reveal complex relationship between food and society, involving material and symbolic aspects of cultures, dietary order, but also aesthetics or hedonism (Lévi-Strauss, 1966, Douglas, 1971, Fischler, 1980, Beardsworth & Keil, 1997). Bringing on stage cultural values, food becomes a central identity marker, defining personality, social class, lifestyles, gender roles and relationships, from family, to community, to ethnic groups or nationality, changing through time and place. Food is a lens to analyze society order, historical changes, power and politics, if we think of the pioneering works in this area of studies, from Pierre Bourdieu’s analysis of the social classes’ taste (1979), Jack Goody’s connection between cuisine and class in West Africa (1982), Sidney Mintz research on sugar, modern times and colonialism (1985), to Arjun Appadurai’s work on nationalism and cuisines (1988). The more recent trend towards food heritage and heritagisation reveals the dynamic role of history in understanding culture, as well as the marketization of culinary traditions. Social changes, like evolutions in intergroup relations within societies, migration phenomena such as nomadism, refugees, expatriates, tourism, alongside with the industrialization of food production or the globalization of foods, the role of mass media and new technologies, all have their impact on the food production, distribution, preparation, foodways or drinkways changing either by expressing individual or group preferences for alternative consumption manners, or at collective level. This special issue of the International Review of Social Research addresses the scholars from these disciplines in particular, with no discrimination between different schools and approaches. We intend to open the debate for interdisciplinary exchanges of ideas and to facilitate crossroads between different disciplines such as anthropology, ethnology, sociology, history etc. The journal will also welcome work from the full range of methodological positions possible today: both quantitative and qualitative, and micro- and macro-level research. Specific methods such as interviews, surveys, questionnaires, ethnographies, documentary sources, textual analyses, participant and non-participant observation will be welcome. We are interested in an extended spectrum of research themes, mostly including: food, identity and social change, food heritage and culinary practices, marketing and food markets, quality of food and health issues, the politics of food production and consumption, food security: issues of quantity and quality, food safety regulations and standards, etc. Some possible topics of the articles can be related to food and group identity: food as manifestation of cultural origins and influences food as transmigration, diaspora and de-colonialism, food and ritual, the histories of food; repasts of the past, food at the interface with class and culture, and so on. The editors kindly request authors to send papers (4,000 – 8,000 words in length) together with an abstract of no more than 200 words, to the following address: anda.becut@culturadata.ro until February 29th, 2016. Prior to submission, please check author guidelines at http://irsr.eu/instructions.html. 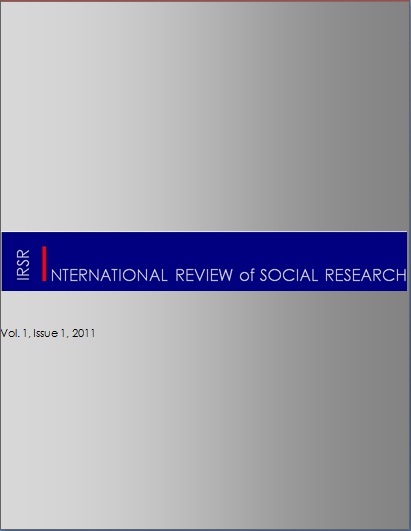 International Review of Social Research publishes original research articles, but also, occasionally, special issues, debates and commentaries that focus on the study of human society, social structures, social change, human behavior as it is shaped by social forces, as well as on any aspects of the scientific study of human beings and culture. International Review of Social Research welcomes articles from all areas of sociology and social/cultural anthropology. No research topic, methodological strategy or geographical location is considered irrelevant, as long as articles are both theoretically and empirically grounded. Comparative, ethnographic, critical and space-sensitive approaches are welcomed. International Review of Social Research publishes articles in English. In order to assure the quality of their English-language submissions, authors for whom English is a second language are encouraged to have their manuscript professionally edited. A list of editing services providers can be found at http://authorservices.wiley.com/bauthor/english_language.asp. (All services are paid for and arranged by the author. Their usage does not facilitate acceptance). International Review of Social Research welcomes the creation of special issues. Guest editors should send a call for papers containing: (1) the proposed title for the special issue; (2) an indication of who the guest editors are and a short description of their area of expertise; (3) a Call for Papers statement to be posted on the International Review of Social Research website. The Call for Papers should have up to 500 words. In addition to that, the guest editors may also choose to submit clusters of four to six articles to the editor in chief. Articles grouped in special issues go through the normal double blind peer reviewed evaluation procedure and should respect the style and format outlined above. Articles, debates and special issue proposals may submitted either directly to irsrjournal@gmail.com OR up-loaded directly on this website (please fill in all boxes). Please read carefully the Author Guidelines before submitting an article. Please type in your e-mail below in order to receive up-dates, call for papers and other announcements.